You know what I’ve always wondered? Why on New Year’s Day do we Scots, especially in the west, go mad for a cheeky steak pie? Well OK, that’s not strictly true. I’ve literally just started wondering this about 20 minutes before sitting down to write this latest Steak Pie review from Whitburn Juniors but it has posed a bit of a puzzle. You see when I think about growing up the correlation between a Steak Pie and New Year doesn’t immediately come to mind. Sneaking up to my Gran’s for the bells before finding a party and then nursing a hangover the next day with a Chicken Chow Mein and The Mighty Ducks trilogy yes. Steak pie, not so much. The reasons seems to be fairly sparse and prone to speculation. One theory harks back to the good old days when New Year’s Day wasn’t a holiday and so a pie was an easily prepared celebratory treat after a hard day at the (in some cases literal) coalface. There’s also a rather, seems-far-too-hippy-to-be-something-a-Scottish-person-would-have-come-up-with, idea that steak pies are round to signify the cyclical nature of the year. The romanticist in me likes to think a wee Granny somewhere made a banging pie and everyone else just decided it was a good idea. Whatever the reason it’s a tribute to the enduring nature of the steak pie that whilst Christmas Day continues to bring an ever increasing kaleidoscope of culinary adventure the humble steak pie forever remains. 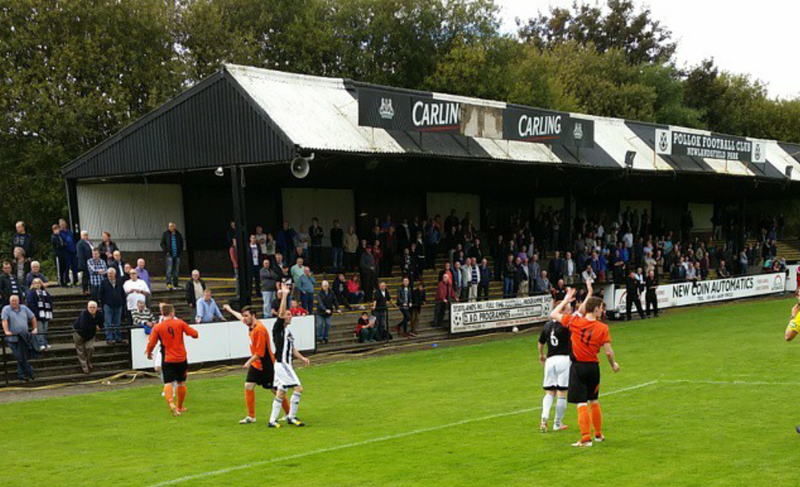 And remain it continues to do so, which brings us to our latest review The Whitburn Steak Pie. So without much further ado, let’s rate some pie! 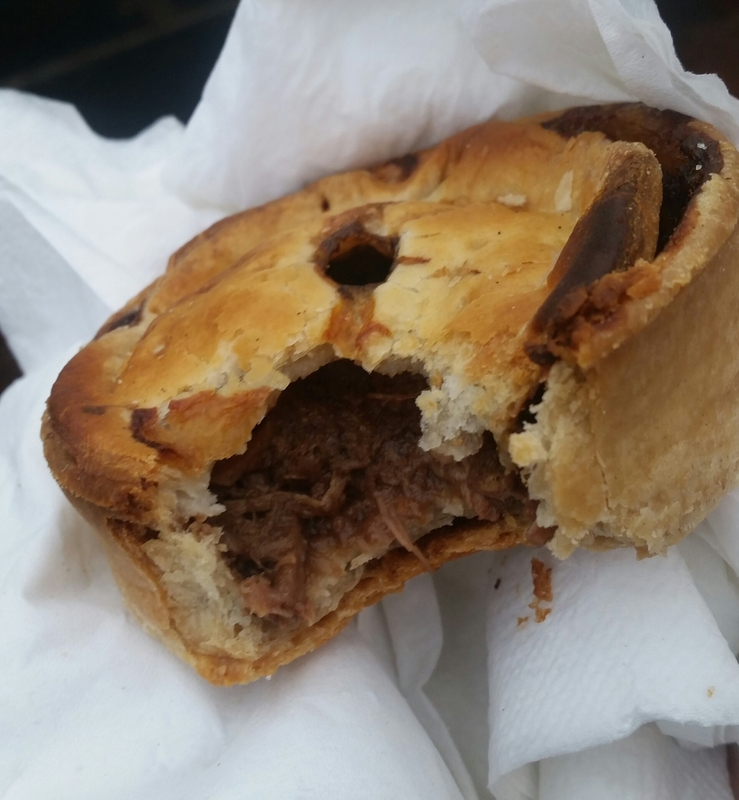 Price: £1.40, which even compared with 2015/16 prices is an absolute bargain in the luxury game day pie market. 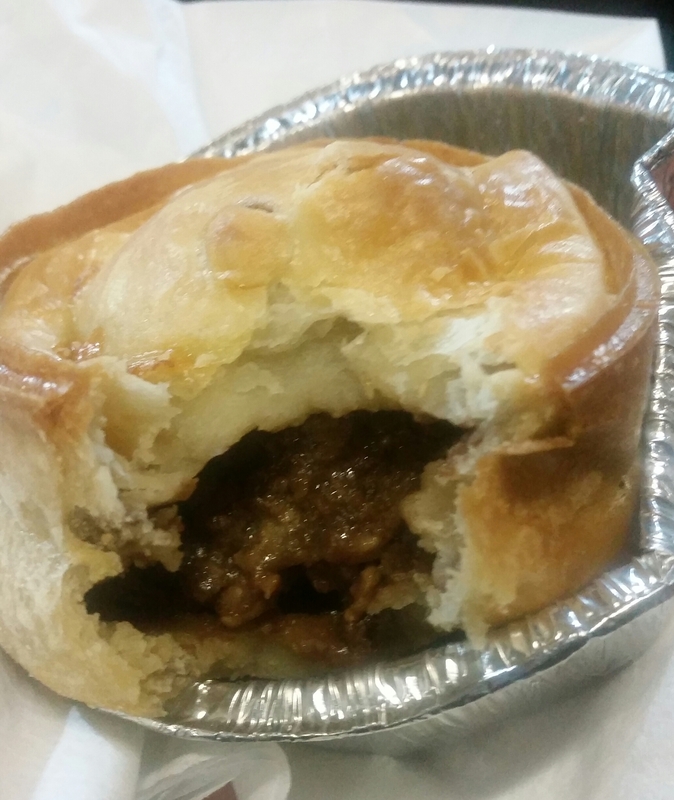 Presentation: Much like its scotch pie compatriot from the same venue this was lovingly wrapped in a medium sized white napkin, a true staple of the match day pie presentation scene. Meatiness: When I have a pie I like to type a few notes on my phone. Firstly to help capture my instant reaction but also to help when I finally get round to writing up a review as time has been known to get away from me. On reviewing my notes on this, The Whitburn Steak Pie, I was amused to find one of my instant reactions around its meaty content was, and I quote “generous as fu*k”. It really was, with large chunks of steak, plentiful in nature and of the texture you’d really hope for when buying such a pastry. There was a couple of drawbacks though. After a few bites it became a little over salty, a gradual build of sodium drawing moisture out my mouth quicker than licking a hairdryer ever would, whilst the gravy wasn’t as plentiful as possible (more on that very shortly). That said there was a good volume of steak and whilst salt heavy it was still a tasty bite. Pastry: It’s safe to say this pastry was a bit leaky. Whilst a perfectionist will bemoan the presence of boil out (a key measure when officially judging a pie) for me sometimes it adds a new and interesting dimension to a pie, which in this instance was certainly the case. Due to the holes a lot of the gravy (as referenced above) had escaped during the cooking process leave chewy little sheets of brown attached to the base. It sounds odd but was actually a nice wee treat and the pastry itself was actuality fairly well baked and held the filling sufficiently. Brown Sauce: It’s been a while so I’ll let you off but never should you dress a luxury pie with brown sauce. The gravy should be plenty and if it’s not then your pie just isn’t quite right. 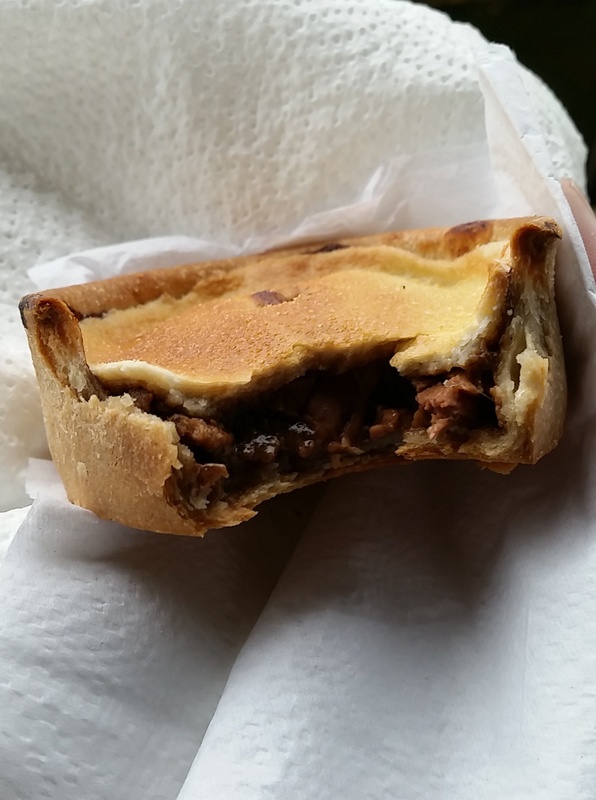 Overall: Generous steak, leaky pastry with an interesting gravy jerky type affect caused by the boil out makes this pie an interesting, if slightly, salty addition to the MFP encyclo-pie-dia. Gravy Factor: Salt “n” Steak. 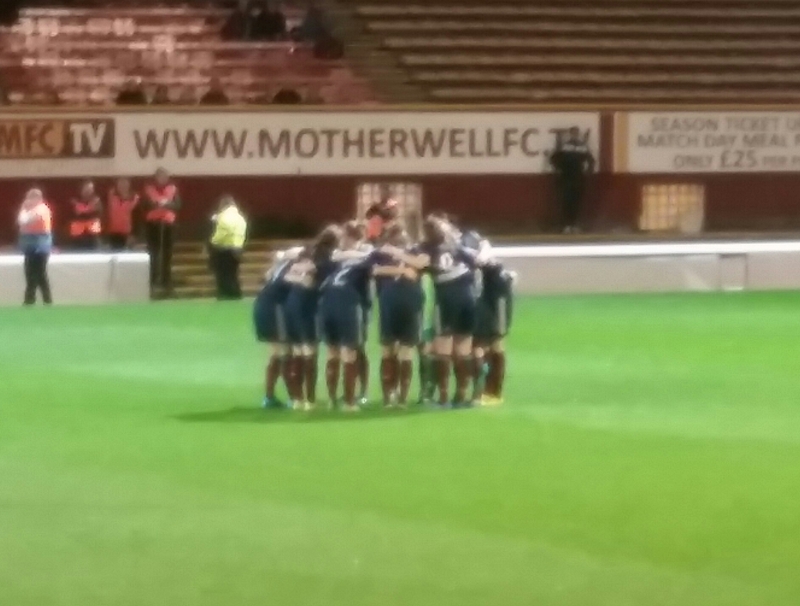 So that’s another review in the books, I plan to try to get to a game this weekend but I’m also acutely aware that I have a pre New Year’s night out planned that may impede my driving ability so a saunter to Hampden may instead be on the cards. Either way I will return, but until next time, have a happy new year, and of course, go forth and eat pie! 2018 is going to be a goodie! 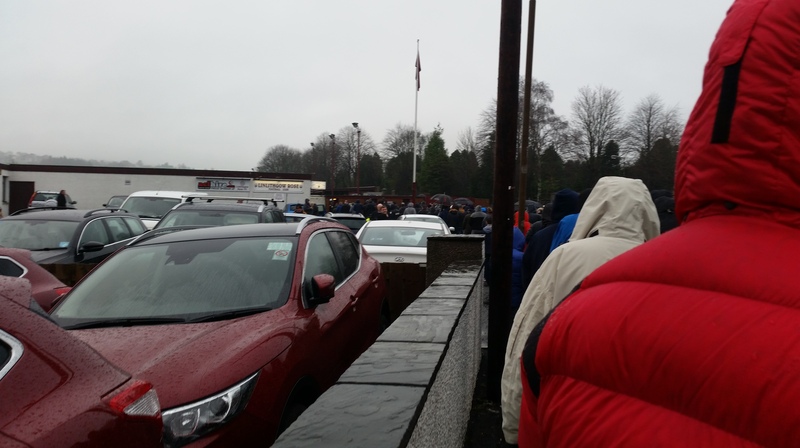 This entry was posted in Football Pies, Junior Pies, Luxury Pies, Non League Pies, Sporting Pies, The Life of Pie and tagged Benburb, Football, Juniors, meatfilledpastries, pastries, pastry, Pie, scottishfootball, scottishjuniorcup, steak, steakpies, whitburn.